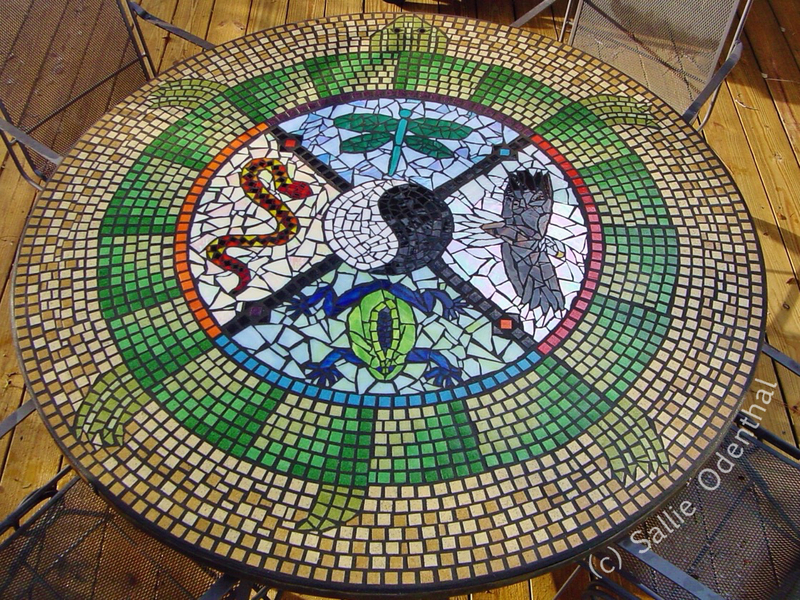 Artist and therapist, Sallie Odenthal of Infinite Healing created this beautiful mosaic table top based on a Native American medicine wheel. What a cool design. I love her use of animals around the wheel and the yin yang symbol in the middle. This mosaic design is based on a Native American Medicine Wheel. The table is 60″ in diameter, and each section represents one of the four directions North, East, South, and West. The wheel is on a turtle’s back representing Mother Earth with a yin yang symbol in the center depicting the importance of balancing the four aspects and energies. In the North, is a dragon fly which for me illustrates the illusionary qualities of the mind, in the East, is a bald eagle representing spirit, in the South is a frog to symbolize the cleansing brought about through emotional awareness, in the West is a snake representing the transmutation of the physical. View more of her exquisite mosaics via her online gallery.